I love Beef Wellington, but let’s face it, it can be complicated (getting the puff pastry wrapped around the tenderloin can be equal to the first time you tried to diaper a squirming baby). It also takes a boatload of time to prepare, so I usually make it only on a holiday or special occasion. How sad – that’s like only using your “good” china and glassware at Thanksgiving, and we ALL know that has become a “No, No” since you never know if you will still be here for that next special occasion. I decided to deconstruct the traditional recipe and make it a new and easier way without compromising the flavors. This recipe still has the same flavor profile (beef, pâté, mushrooms, onion, sherry) but now I can make and serve it in around 30 minutes instead of 2.5 hours. When I prepared the steak I used Hawaiian salt to season it. Until about a month ago I had never used the stuff (even though I had a package of it in my pantry). Thanks to my sister Judy (who happens to be a fabulous cook), I now use it religiously when seasoning steaks and seafood – thanks Sis! 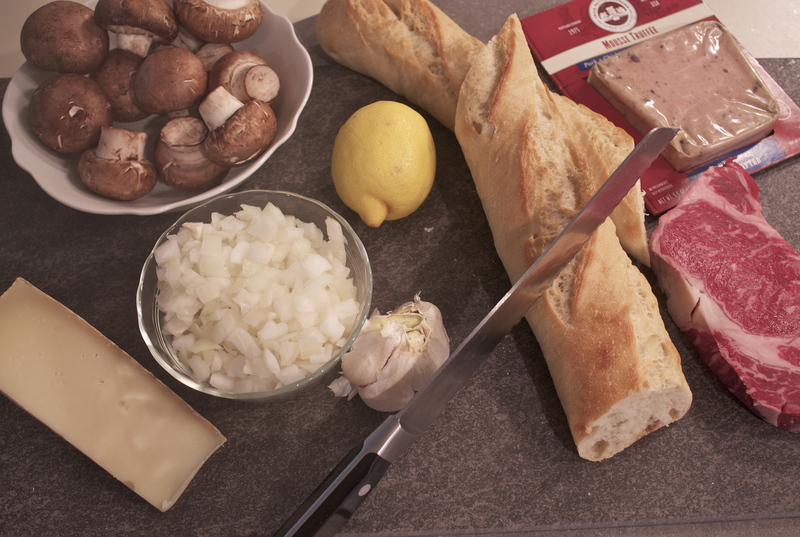 Steak, onions, mushrooms, pâté, baguette, Gruyère cheese, and more… the start of a great Beef Wellington Bite! 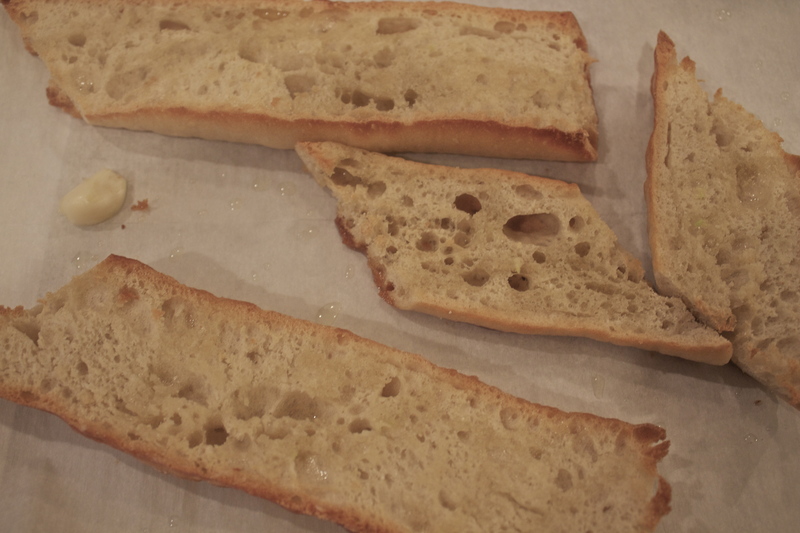 Cut baguette in half, then into diagonal sections, and sprinkle olive oil on top. Into a 400 degree oven for 10 minutes. Rub cut garlic on top after lightly browned! 1. Cut the baguette in half and on the bias. Place on baking tray and pour light sprinkle of olive oil and put in 400 degree oven for about 10 minutes till it starts to get crusty. 2. 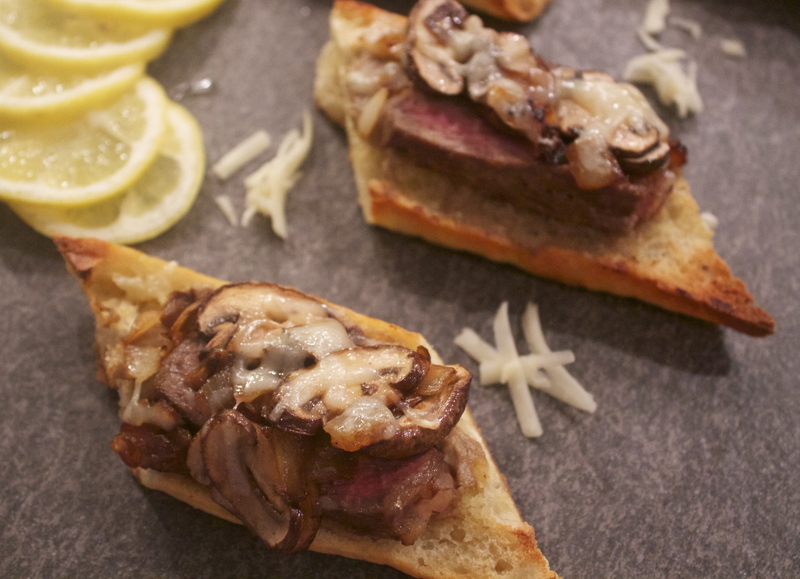 While crostini is in the oven, clean and slice mushrooms and add to a non-stick pan and do a round-about swirl of olive oil – sauté the mushrooms till lightly browned, add two splashes of sherry and then let it cook down to zero moisture – then transfer to a plate. 3. Using the pan you just used, add the diced onions to one side of the pan. Add a swirl of olive oil and then add a sprinkle of Hawaiian salt to one side of the steak and place in the pan with the onions. Fry for about 3 minutes, salt the top side, turn over and continue cooking until medium rare. Remove from pan to a plate and let rest before cutting into strips. 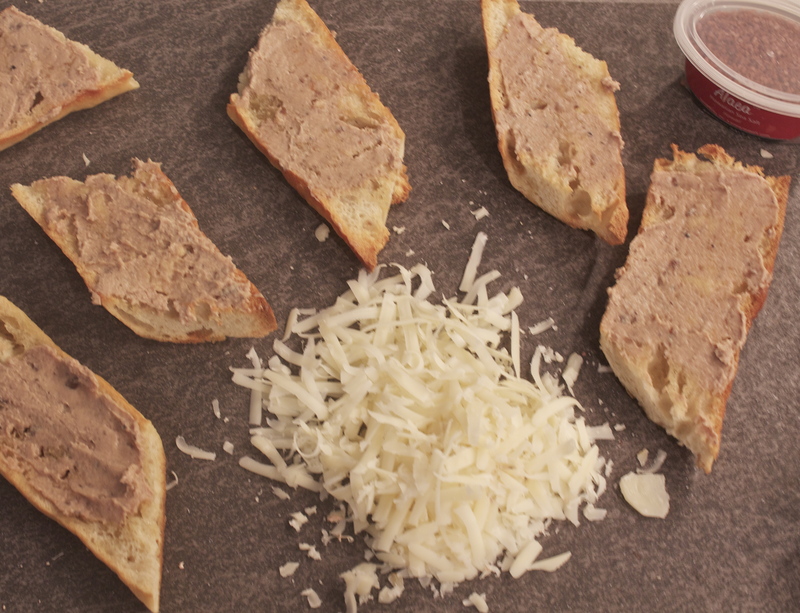 After you have rubbed the crostini with garlic clove, spread each piece with pâté. 4. The crostini is now done. Remove from oven, place on rack and rub the cut clove of garlic across all the crostini, and then let cool for about 5 minutes. 5. Take warm crostini and lightly spread with the liver pâté. Be sure and buy a creamy “mousse” type of pâté (as opposed to the hard and chunky type), so it spreads nicely on your bread. 6. 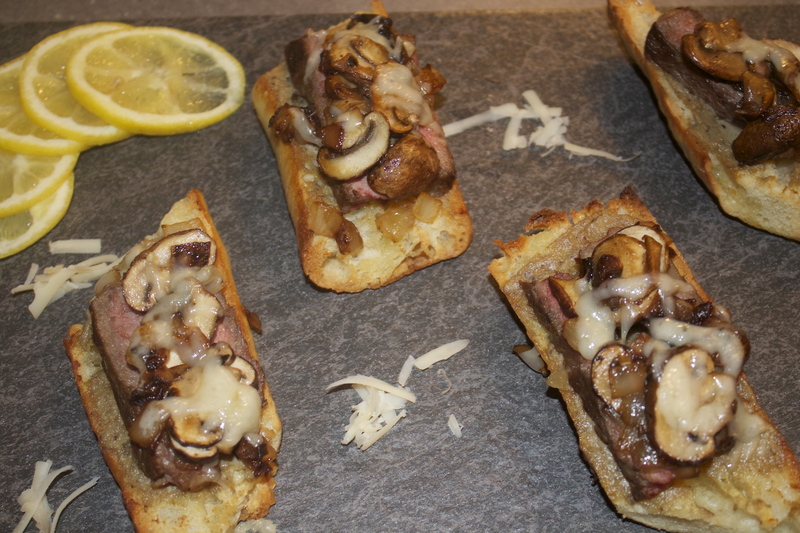 Layer a piece or two of steak on top of the liver pâté, then top with mushroom/onion mixture. Grate the Gruyère cheese and sprinkle on top of everything and pop under the broiler till cheese melts. Arrange the Beef Wellington Bites on a platter, squeeze a bit of lemon juice on top, and serve! These appetizers are hearty and great for a cocktail party or just while “watching the game”. Or, serve them with a cup of tomato or french onion soup, and you have a great dinner, and didn’t have to wait for a special occasion to enjoy it! Gruyère has melted nicely and the Beef Wellington Bites are warm, crusty, and gooey! 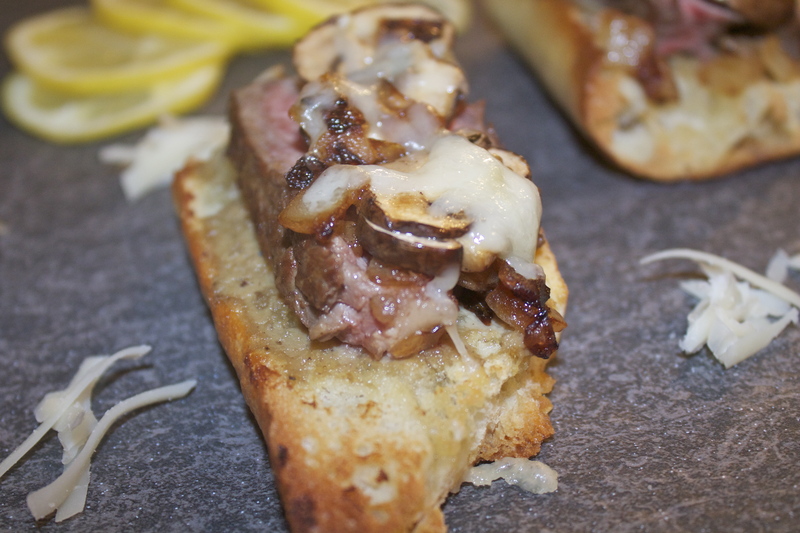 Steak, mushrooms, pâté, sherry – all on a crusty baguette – YUM! All the flavors of Beef Wellington, but in half the time and effort. That looks & sounds really goooood!!!! Will have to try it sis.